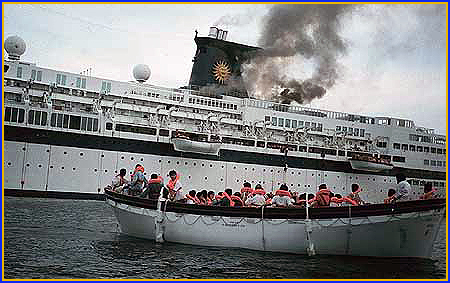 On 20 May 1999 Sun Vista (ex-Galileo Galilei (1963)), bound for Singapore from Phuket, Thailand, suffered an engine room fire that led to her sinking the following day at 0121 local time. Passengers flee Sun Vista as the vessel begins to list. Panic, terror, and incompetence reigned on board the Singapore-owned cruise ship as the power failed. The fire, located in the main engine room switchboard, was first reported at 1500 local time. Yet it took more than three hours before a distress signal was transmitted and an additional hour before passengers were taken off in 18 lifeboats and four life rafts. Although all 1,090 passengers and crew were safely evacuated, some had to spend up to eight hours in the open boats before being rescued.